PCL Construction Management, the general contractor on $278 million Mosaic Stadium, released new data regarding the project’s progress. 400 workers on the site already carried out 1,200,000 man-hours and poured well over 32,000 square meters of concrete, leaving only 1,800 left to be poured. The vast amount of concrete means basically that the primary structure of the stands is ready. On all three sides where there are significant structures above ground level (south end open) the future seating is almost ready with steel roof structure complete above the east and north sections. Upcoming weeks will bring significant changes. First, seats will begin arriving on the east side. Second, roof panels will also be installed, beginning in the east. Third, the field is on its way. It will be located 10.5 meters below ground level, which means there’s further 0.5m of excavation works to happen once heavy machinery is removed from the 10,500-square meter area. Significant changes will also follow around the stadium. A vast area of 28,600 square meters will be paved for public plazas and parking spaces in direct vicinity of the stadium. 173 shrubs and 134 trees await planting to make the place a friendly one. New Mosaic Stadium will be fully operable in 2017. 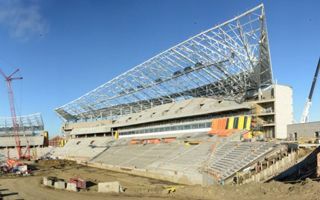 Its primary tenants will be the Saskatchewan Roughriders, though it will also be used for soccer, allowing even potential World Cup games. Starting capacity will be set at 33,000 seats, though the open south side will allow for rapid expansion when needed.